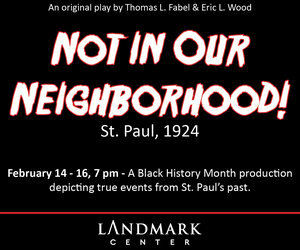 Presented by Minnesota Landmarks, and written by Tom Fabel and Eric Wood and directed by Eric Wood, this original historical play depicts the true story of vicious opposition by White Groveland Park citizens to an African American couple moving into their neighborhood in 1924. The play runs until Feb. 23 with select dates. As of press time, tickets were available for shows on the 14, 22 & 23.